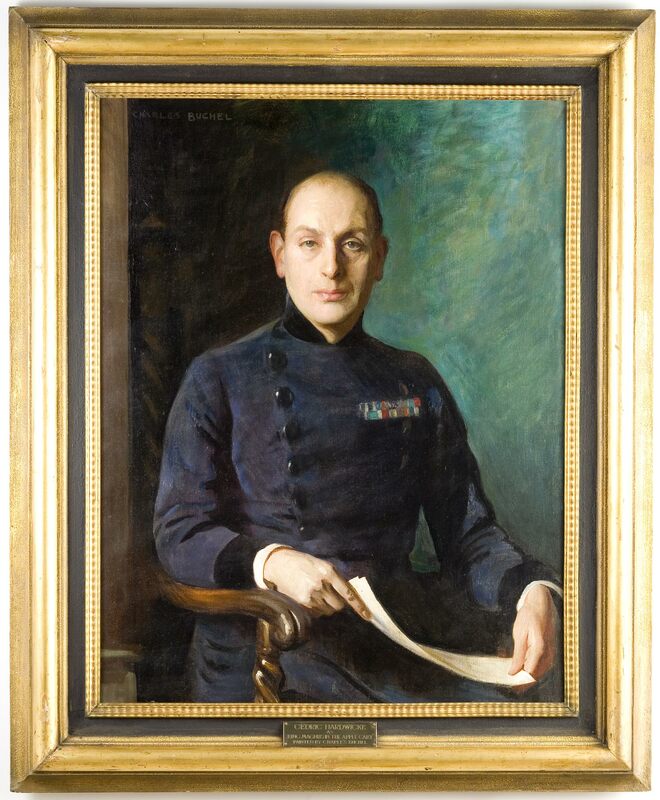 A portrait, painted by Charles Buchel, of Cedric Hardwicke in the role of King Magnus in "The Apple Cart", the stretcher stamped Chas H. West. Artists Colourman and Picture Framer. 117 Finchley Rd London NW3 and within the original gilt-wood frame. English circa 1920. Charles Buchel (Karl August Büchel 1872-1950) was born in Mainz, Germany, but came to England as a child. He studied at the Royal Academy Schools and in 1898, he began to work for the actor-manager, Herbert Beerbohm Tree, with whom he was closely associated for the next sixteen years. He painted many portraits of Tree, as well as posters, programmes and other theatrical works. As a result of this connection Buchel became well known in theatrical circles and painted many leading stars of the day, including Henry Irving, Lily Langtry and George Alexander. He also illustrated several theatrical magazines. Sir Cedric Hardwicke was one of the great character actors in the first decades of the talking picture. He was born in Lye, England on February 19, 1893 and attended the Royal Academy of Dramatic Art making his stage debut in 1912. His career was interrupted by military service in World War I, but he returned to the stage in 1922 with the Birmingham Repertory Theatre, distinguishing himself as Caesar in George Bernard Shaw's Caesar and Cleopatra, which was his ticket to the London stage. For his distinguished work on the stage and in films, he was knighted by King George V in 1934, a time when very few actors received such an honor.